It is made with a new state of the art 3.5 mm “Millennium” weave finish which enhances the durability over the already tough CZD nylon finish. It has an unsurpassed stretchiness and smooth feel to the touch reducing drag. To maintain this stretch, we use extra-large super tough rubber knee pads that best be described as similar to a flexible soft rubbery feel. 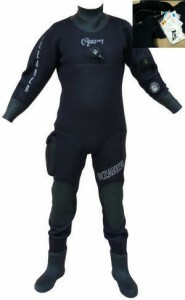 It stretches with the suit and gives the knees longer wear. It has a zipper flap to protect the standard Master Seal Zipper by TiZip ™. If you prefer, we can install a BDM Brass Zipper at no additional charge. The CZD Plus is also built with a neck dam for your hood and comes with a bag. It is built with SiTech valves. Code # CZD 02 (Specific Size required w/ shoe size and neck measurement) No extra charge for this extra service!